Click here to sign up for our e-newsletter to stay up-to-date on future events! 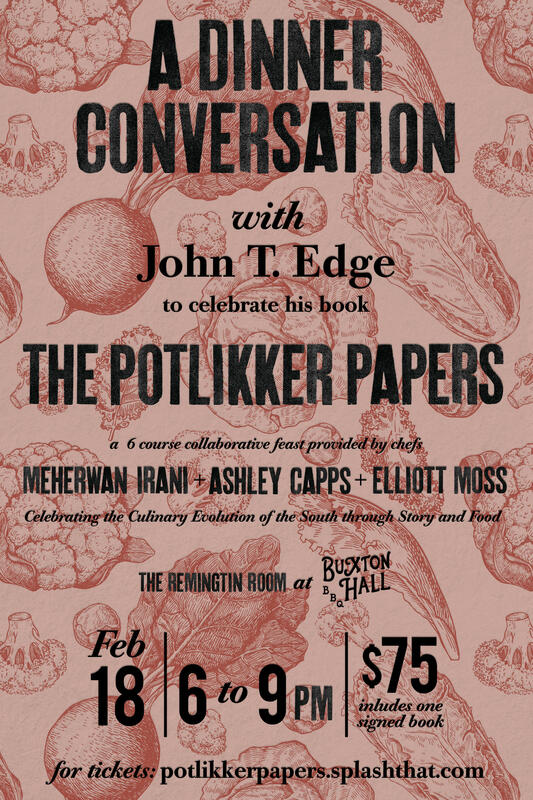 Join us for a six-course collaborative feast from Chefs Meherwan Irani of Chai Pani and Ashley Capps and Elliott Moss of Buxton Hall in celebration of John T. Edge's critically acclaimed book The Potlikker Papers. The Potlikker Papers is a people's history that reveals how Southerners shaped American culinary identity, and how race relations impacted Southern food culture over six revolutionary decades. This feast aims to something similar. Each course will be based on seminal moments from the book, traveling through the decades into modern day, and culminating in a meal which shows how southern food has become a shared culinary language for everyone that lives here. Included with each ticket is 1 signed copy of The Potlikker Papers. For the last sixty years, the dishes we have cooked and the meals we have staged have served the region and the nation as emblems of Southern struggles. Conversations about food have offered paths to grasp bigger truths about race and identity, gender and ethnicity, subjugation and creativity. Today, Southern food serves as an American lingua franca. Like the Black Power fist and the magnolia blossom, fried chicken discloses, cornbread suggests, potlikker tells. A copy of The Potlikker Papers is included with each ticket. John T. Edge directs the Southern Foodways Alliance at the University of Mississippi. He is a contributing editor at Garden & Gun and a columnist for the Oxford American. In 2012, he won the James Beard Foundation’s M. F. K. Fisher Distinguished Writing Award. Edge has written or edited more than a dozen books. He has served as the culinary curator for the weekend edition of NPR’s All Things Considered and written the “United Tastes” column for The New York Times. Edge lives in Oxford, Mississippi, with his son, Jess, and his wife, Blair Hobbs. In 2009, Irani quit his day job in sales to open his first restaurant– Chai Pani, a unique Indian street food joint in downtown Asheville. Whether it was a midlife crisis or a stroke of genius is debatable. In any case, the self-taught chef has now opened his fifth place, with more on the way. With two James Beard Award nominations for Best Chef in the Southeast under his belt, he's finally confident this might be working out. His restaurants have been written up in the New York Times, Wall Street Journal, GQ, Food & Wine, Men's Health, USA Today, and Bon Appétit, among others. Not bad for a former salesman. He accredits his business success to the amazing people he works with each day, including his business partner and wife, Molly. Elliott Moss is a son of the low country of South Carolina. The rich characters, humble attitude, and low country cuisine he grew up with very much influence his approach to cooking today. Having paid his dues for years in the food industry, it was a move to Asheville to helm the kitchen at The Admiral that brought him regional and national attention as one of the most acclaimed chefs in the area, earning rave reviews from The New York Times, GQ Magazine, Food & Wine Magazine, Martha Stewart Living, Conde Nast, and many more regional & national publications. He was nominated for the James Beard Award for “Best Chef Southeast” in 2013 during his stint at the Admiral, and continues to garner accolades now that he's opened his dream restaurant, Buxton Hall Barbecue, with the Chai Pani Restaurant Group. Ashley Capps, who grew up in the South, says that her love for food was instilled at a very young age through her mother, who was the catalyst for her initial love of both cooking and creating. Capps has been working in the restaurant industry since 2002, but it was at her very first restaurant gig in Athens, Ga. where she was first immersed in the farm-to-table restaurant culture. Now as head pastry chef at Buxton Hall, Capps says that what she is most proud of is that everything made at Buxton Hall is made fresh, and with heart, using local, seasonal ingredients. Elliott Moss is a son of the low country of South Carolina. The rich characters, humble attitude, and low country cuisine he grew up with very much influence his approach to cooking today. Having paid his dues for years in the food industry, it was a move to Asheville to helm the kitchen at The Admiral that brought him regional and national attention as one of the most acclaimed chefs in the area, earning rave reviews from The New York Times, GQ Magazine, Food & Wine Magazine, Martha Stewart Living, Conde Nast, and many more regional & national publications. He was nominated for the James Beard Award for “Best Chef Southeast” in 2013 during his stint at the Admiral, and continues to garner accolades now that he's opened his dream restaurant, Buxton Hall Barbecue, with the Chai Pani Restaurant Group.